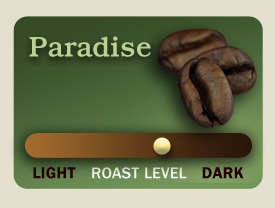 Paradise blend is now a new, exciting blend! We combine a sweet nutty South American with the heavy body of a Indonesian and and an African. It is roasted to a medium dark to create a heavy mouth feel and sweet finish. Also makes a great espresso blend.